Net carbs refer to the digestible carbs counted on a low-carb diet. Although pancakes have only 11 grams of net carbs per 4-inch serving, they may be a tough fit on a low-carb diet -- especially if you're restricted to 20 grams a day following the Atkins plan. But with a little creativity, you can create low-carb pancakes using alternative flours, eggs or cottage cheese. Similar to a baking mix for regular pancakes and waffles, you can create a low-carb version with wheat bran, soy flour, whey protein, ground flaxseed and wheat gluten. Mixed with eggs, baking powder, half and half and salt, this low-carb baking mix makes pancakes with 3 grams of net carbs. Net carbs are calculated subtracting fiber from total carbs, or 5 grams of total carbs minus 2 grams of fiber, which equals 3 grams of net carbs. You may also be able to find a ready-made mix for low-carb pancakes. Like the homemade low-carb baking mix, a commercial brand contains low-carb flours such as wheat gluten. Using this low-carb mix with oil, eggs and water creates one serving equal to three pancakes that has 7 grams of net carbs. Wheat flour isn't the only option when making pancakes; there are a number of low-carb options. Coconut flour, with 3 grams of net carbs per 2 tablespoons, makes a good choice. While recipes vary, you can make a 4-gram net-carb cake mixing the flour with eggs, almond milk, butter, vanilla extract and sugar substitute. Add cinnamon or nutmeg to vary the flavor. Coconut flour holds more fluid than wheat flour, so you'll use less in your recipe. Start with 1/4 to 1/3 cup of coconut flour in place of 1 cup of wheat flour and adjust to your taste. 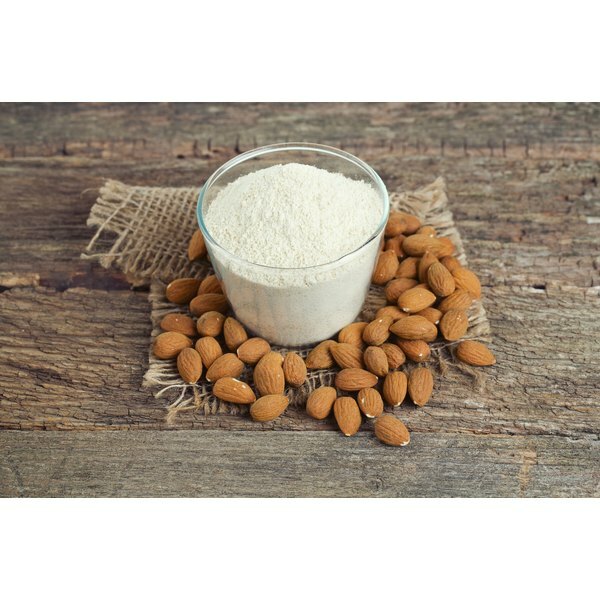 If you're not a fan of coconut, try almond flour, which offers another low-carb alternative, with 2 grams of net carbs per 2 tablespoons. Unlike coconut flour, there's no recommended ratio for amount of almond flour to replace wheat flour, so you may need to play with your recipe or use one already established. Almond flour creates a denser pancake, so add an extra egg or seltzer water to make them fluffier. For a flourless pancake, try using cottage cheese as a base. Mixed with eggs and powdered psyllium, cottage cheese pancakes have 3 grams of net carbs per cake. Pancakes a little closer to what you're used to can be made by adding a bit of flour or pancake mix -- about 1/3 cup -- to the cottage cheese pancake recipe to add texture and flavor. Use a whole-grain flour to up the fiber and lower the carb content. Protein pancakes are tasty, easy to put together and may work for those new to low-carb eating. These recipes typically use oat flour in place of wheat flour and include eggs or egg whites and protein powder. The carb count varies depending on the recipe, but tends to be higher than low-carb recipes, with as much as 12 grams of net carbs per pancake. Keep them as low-carb as possible by ditching the oat flour and using protein powder as the main dry ingredient. With 13 grams of net carbs per tablespoon, maple syrup won't fit most low-carb plans. If you like your pancakes sweet, add raspberries or strawberries to your batter. One-half cup of raspberries adds 3 grams of net carbs, while the same serving of sliced strawberries adds 5 grams of net carbs. Better yet, go for savory cakes. Crumbled bacon or sliced ham mixes well with pancake batter to create a tasty cake. Or, up the nutrition with grated zucchini or summer squash or with sliced mushrooms or tomatoes. Roll with slices of chicken breast and eat like a burrito. Make them moist by adding a low-carb, cheesy sauce. Those who prefer a traditional topping for low-carb pancakes can use sugar-free syrups, which have zero to 1 gram of net carb per tablespoon.